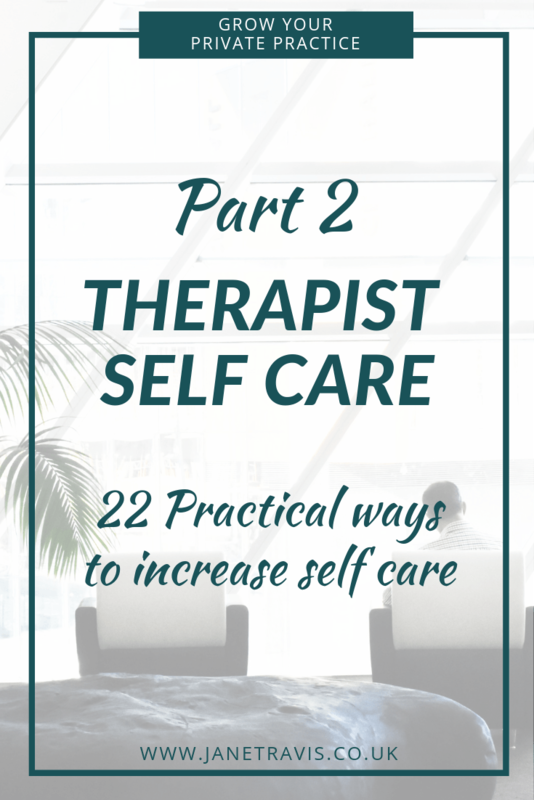 In 'Therapists Self Care part 1' we looked at why self care for counsellors and therapists isn't just something that's nice to do, it's VITAL for both you and your clients. Just reading that blog will give you a head start, as awareness starts change and you can do something to protect yourself. But you can also put things in place on a practical level. Self care can be split into 2 types: professional and personal. Professional self care is how you can make changes in your working life to help protect yourself. Put in place and maintain clear boundaries. For example, get really clear about how you handle after hours phone calls and emails. If you consider this in advance, it makes the whole process easier. For me, I have a landline and I use this for work, my mobile is purely for me. I got very clear on this after a client rang me in the middle of a works Christmas meal/night out in distress. Don't let that happen to you - it was horrid! Decide how many clients you want to work with and stick to that amount. 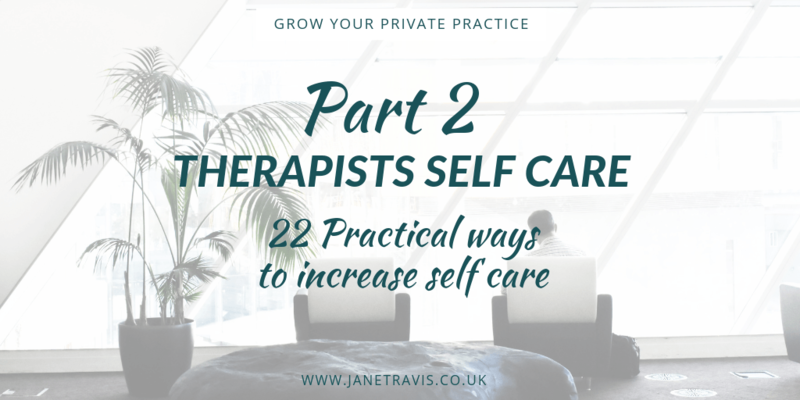 I often hear of therapists taking on more clients than their maximum, partly because they worry they will have a sudden drop in clients, and partly because they don't know how to handle enquiries when they are full. Deciding in advance how you'll manage enquiries when you are full takes away panic and anxiety when you get an enquiry. 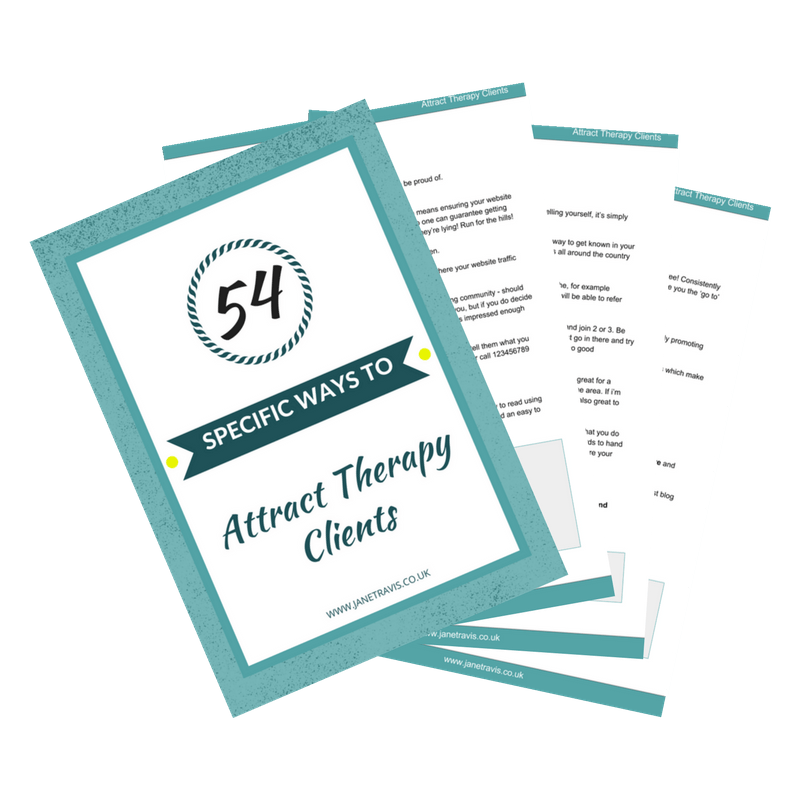 You have 2 options, start a wait list or refer them to another therapist. And consider what you will say on the call or in the email. I recommend keeping it very simple: 'unfortunately, I'm at capacity at the moment - would you like to go on my waiting list/ would you like a recommendation?'. Remember, you aren't responsible for everyones wellbeing, you are only 1 person. As trainees we have a group of people all going through that process of self discovery, learning and often we have deep, personal conversations and connections with our peers. But what happens when that ends? I founded and ran the Lincoln Counsellors Network for 4 years, and when I asked for anonymous feedback from the group the thing that came up time and again is the connection and support members felt from other counsellors and how it helps to stave off the isolation some feel. If there isn’t one in your area, start one! Make it as formal or informal as you like. Mine had guest speakers, but you could just meet for coffee once a month. This is a difficult one in private practice as if you don't work, you don't get paid. So a 2 week holiday costs the price of the holiday plus 2 weeks income. However, in order to avoid burnout you need a change of scenery from time to time to recharge those batteries so regularly save so you can take a holiday. And if money is tight, a weekend break will give you a change of scenery, or visit friends/relatives. Here in the UK, supervision is a requirement. We are required to have 1 1/2 hours supervision a month or more. It's used to talk through client cases, explore processes, check out any 'blind spots' you have and generally be a supportive. There may be aspects of training, but that's not the main function. And we are required to have it throughout our careers, whether newly qualified or 20 years in. It's not purely about client work, it's okay to talk about your own issues around being a therapist. So use your supervision well. Talk about your fears about getting it wrong, that you're not good enough, worries about charging clients, that you feel drained, are 'running on empty' and needing support. Your supervisor should be able to help you with these things, but if you don't feel like you can talk about this, worry you'll be judged or criticised then consider whether this is the right supervisor for you. For example, it can be hard when a client stops coming to sessions with no explanation. Talk this through, explore what's coming up for you, it's what supervision is there for. However, I know that supervision isn't always a requirement depending on what country you are in, so maybe you could search out other therapists to have peer support or peer supervision. As well as 1:1 supervision, search out or start up peer supervision if you want more or a different kind of help. 6. Charge for your services. Charging for your services is basic therapist self care. It evens up that balance of you giving and not taking. So if you are still volunteering long after you've qualified, start taking private clients. Feeling fear or resistance about this? Well fear is a pretty normal response to something that takes us out of our comfort zone but it doesn't mean you cannot or should not do it. If you feel anxiety, then explore that and see what comes up. Talk about it with a supervisor, or get some personal therapy and work through it. This is a 2 birds one stone situation, where you build your business whilst also meeting other non counselling people in the local area. I’ve made some very good friends via business networking clubs. There are some very supportive and informative Facebook groups out there that will enable you to connect with other therapists. You could join the Grow Your Private Practice group, which I run. It has over 4000 therapists in there, lots of support, tips, help and advice. I do a live Therapists Marketing Mastermind every Friday at 3.30pm GMT where I answer all your marketing questions. And it's fun too! It's been described as being like a staff room. Come join us! Having a routine at the end of your working day helps to draw a line between your professional and personal life making for a better work/life balance. Journal: before you finish for the day spend a few minutes journaling about your professional day. This helps 'turn off' the therapist ready for the evening. Write a to do list for the next day so you don't have to remember everything, clearing mental space and energy. Turn on voicemail and out of office message for emails. You’ll be sitting a lot in your professional life so ensure your chair is comfy! Consider your posture, look after your back. Consider how you space appointments. If employed or renting rooms, this may not be possible but if you can, allow some space between appointments. It also means I have set times I work with - 10am, 11.15, 12.30, 2pm, 3.15 etc. I don't fill every space, but it makes it easier when making bookings. And talking of making bookings, take control of your diary. It's frustrating having clients dotted all over the day - one at 10, one at 2, one at 5.30 - but more importantly, you're energetically 'on the clock'. So when a client calls for an appointment, take control and offer them the 2 times that are most convenient for you. 'I've got 10am on Monday, or 4.15 Thursday'. If they can't do those, offer a third time you'd like to fill. Only if that fails to result in a mutually beneficial time do I ask when is best for them. And again, boundaries! I never take clients on Fridays, so 'can you do Friday evening' is an absolute no! As therapists, we can potentially spend a whole lotta time sitting down, so find ways to bring activity to your day - a walk at lunch, even a short one, is very beneficial, or some stretching or yoga will help. And while we're on the subject of lunch, remember to block off time for a lunch break. Do you have a personal life, or has all your spare time become wrapped up in personal development, reflection and self knowledge? BALANCE is the key! HAVE FUN!! But NOT anything to do with caring for others! Therapists often volunteer to do something that’s in the caring arena, but this is about filling your emotional stocks, not depleting them further. Make it about fun like amateur dramatics, or nature conservation. Journalling helps in so many ways - it's a great way to reduce stress, clarify thoughts, and a safe place to vent and rant etc. It can help you identify stressors, where you need to make or tighten up boundaries and stop feelings from becoming overwhelming. And if you need help getting started, check out my 'How To Start A Journal' guide. Make a bucket list and work through it. The great thing about a bucket list is it reminds you what life is for - living! For making memories, experiencing new things, travelling and making things happen. Not sure what to put on it? Here are 329 things for inspiration. Is there something you've always wanted to do, like ride horses, take a cooking course or watch a TV show being filmed? Or maybe you had a hobby but stopped it. And similarly, did you always want to paint, knit, act? Creative activities are good for us in so many ways, so how can you incorporate more creativity into your life? We all know the benefits of therapy, so would some personal therapy be helpful for you? Do you have some unresolved stuff lurking around that keeps tripping you up? Being in private practice brings up all sorts of issues like Imposter Syndrome, Shiny Object Syndrome, perfectionism, procrastination, feeling not good enough and all manner of self sabotage. So personal therapy is not only good for you on a personal level, but also a professional one. How much easier would marketing your practice be without those critical voices whispering in your ear? Aah, beautiful sleep! We all just love it! But many of us are sleep poor, so take a look at 'How to create a morning routine to kick start your day' and especially the bit about the Amish hour! It's now easier than ever to turn off electronics as most people have the ability to record programs so you aren’t dictated to by tv! Don't underestimate the amount of mental effort required for effective listening. Think of ways you can lighten the load. For example, I've started getting most of my groceries online and having them delivered as I HATE going to the supermarket with a passion! It helps me save money as I'm not impulse buying, and a a ton of time and all the hassle of driving, shopping, queueing, packing, unpacking again... well, you're aware of the process! Maybe you could get other help - a cleaner, or a gardener, or someone to do the ironing. Yes, you're having to pay them, but it frees up time, energy and reduces pressure. You could also hire a Virtual Assistant. I have a VA and she's wonderful! It's reduced my workload, she does things in a fraction of the time it takes me - and does it better! - and has freed me up to concentrate on the things I need to do that can't be outsourced. Burnout will be avoided if you strives for general balance between work, intimate relationships, parenthood, community and friends, and solitude. Being a therapist is an amazing profession and the job satisfaction can be out of this world, so take your self care seriously, prioritise it and protect yourself. What self care activity would you add to this list?